The Vector Signal Generator R&S®SMV03 is based on the successful analog Signal Generator R&S®SML03 and features the same excellent technical characteristics. 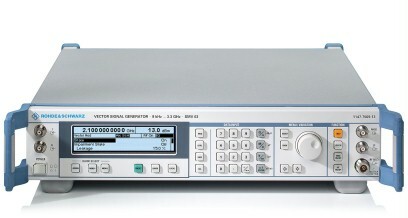 The Vector Signal Generator R&S®SMV03 is based on the successful analog Signal Generator R&S®SML03 and features the same excellent technical characteristics. It comprises an additional broadband I/Q modulator that is able to generate any digital signal in conjunction with an external I/Q source. The R&S®SMV03 is, therefore, a way of entering the wide field of automatic test systems as well as gaining access to applications such as R&D and service. When used together with the R&S®AMIQ and R&S®WinIQSIM™, the R&S®SMV03 can generate digital signals that meet any requirement.